Cummins Westport (CWI) announced in January that the ISX12N engine is CARB-certified to an astounding 0.02 g/bhp-hr NOx. The actual emissions performance is a miniscule 0.01 as shown on the CARB certification form. The 0.02 emissions level is considered by air regulators to be equivalent to the emissions from a battery truck that is powered by the electric grid. Imagine achieving emissions equivalent to a battery truck today with the commercially proven performance of a natural gas engine. How clean is 0.02? Super clean. The 0.02 certification is 90% cleaner than today’s truck emissions standard, 98% cleaner than the certified levels of most of the trucks operating in the Ports of LA and Long Beach, and 99% cleaner than the real world in-use emissions of diesel trucks on the road today in Southern California. Insanely low NOx emissions are only half of the story. The other half of the story is super low greenhouse gas (GHG) emissions with Renewable Natural Gas (RNG) powering the engine. RNG is the lowest carbon intensity fuel available on the market according to CARB’s Low Carbon Fuel Standard. 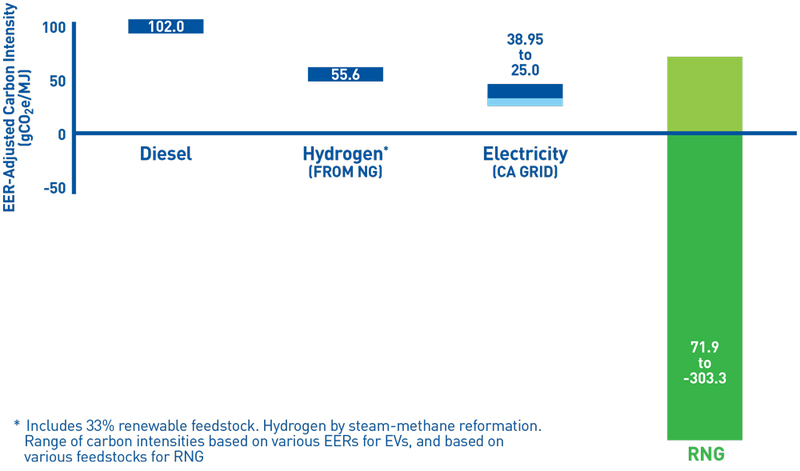 The accompanying chart shows the carbon intensity ranges of diesel, hydrogen, grid power, and RNG. RNG is the clear low carbon winner. RNG produced from food waste and dairy farms can have negative carbon intensity. Negative carbon means subzero GHG emissions. Yes, less than zero GHG emissions. Subzero GHG emissions are mind boggling, but true. 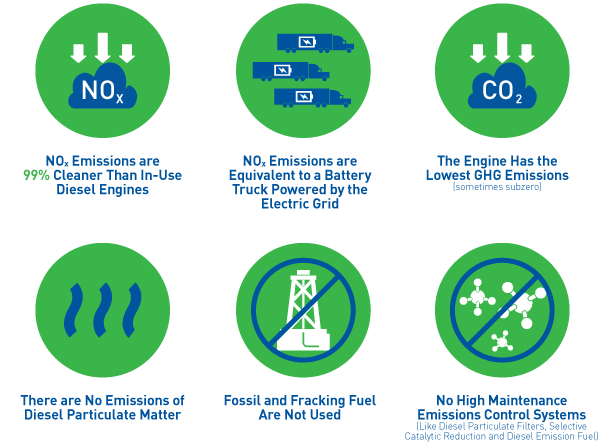 CWI’s playbook for creating this clean engine was to improve the emissions performance of the already proven 12 liter engine that has been on the market for more than 3 years and operated by major trucking companies across America. What delivered these powerful results were enclosing the crankcase, using a higher performance catalytic converter, software changes and super engineering. CWI begins commercial production of the ISX12N this month. The truck manufacturers – Kenworth, Peterbilt, Freightliner, and Volvo – will be shipping trucks with this zero-equivalent engine this year, some as early as Q2. Generous grants are available to incentivize early deployments of the ISX12N. We can now breathe better air and we don’t have to wait for another new technology to commercialize.